Cab Grid Pro v5 makes use of URL rewrite functionality to present more user friendly web addresses for resources. Amongst other advantages, this helps with email deliverability since some spam filters flag messages which link to WordPress folders. Cab Grid Pro v5 will attempt to update rewrite rules automatically. This requires the .htaccess file on Linux (or web.config on Windows) in the WordPress install directory be editable by WordPress. However, not every web server supports this functionality. It may be that the rules need to be updated manually (see below). 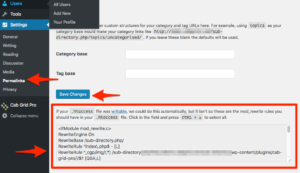 Try re-saving permalinks: From the WordPress admin, go to SETTINGS > PERMALINKS and click SAVE CHANGES at the bottom twice. 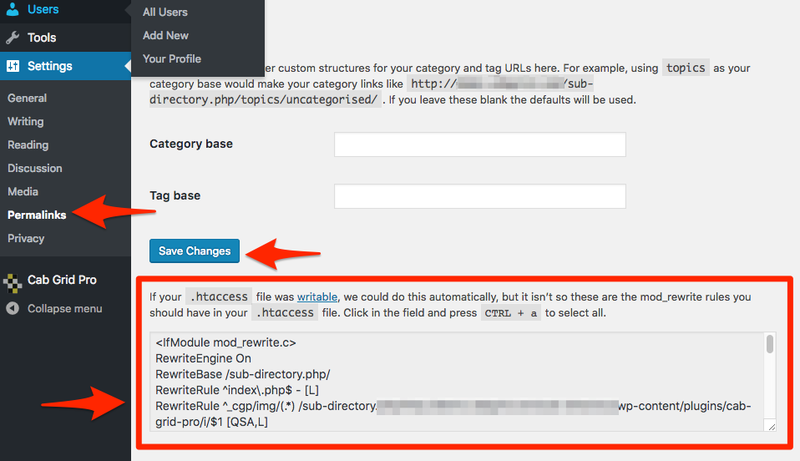 This will look up all of WordPress’ required rewrite rules and attempt to update the .htaccess file. If this fails, the .htaccess file will need to be updated manually. This involves downloading the .htaccess (or Web.config on Windows) file using a File Transfer Protocol (FTP) application from the web server, editing it, and re-uploading it to the server. Click the radio button labelled “No” to switch off rewrites (use long direct link addresses). Hi, as we talked yesterday, we decided to update to version v5, but we are having problems with the appearance, it may be because I have to update to version V5.0.2 but I can not find this update. I need your help soon because we are standing at work. Please contact us via the either our support page (https://cabgrid.com/support) or via the chat window at the bottom right (where you can leave a message if we’re offline).